MapleStory iTCG is a trading card game that was put out by Wizards of the Coast. It is based on the MMO MapleStory put out by Nexon. The trading card game was released for players of the Global edition of MapleStory, in November of 2007, however it has also been released for the Korean and Japanese versions also. 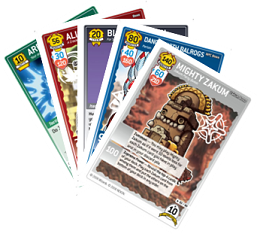 Set 5: Behold Zakum was the last official set released in November 2008. On July 30, 2009 it was announced, on the new iTCG Online forum, that a new iTCG Online Flash Game would be released. Not many details are currently know except that it will be web broswer based and closed beta will begin August 11, 2009.